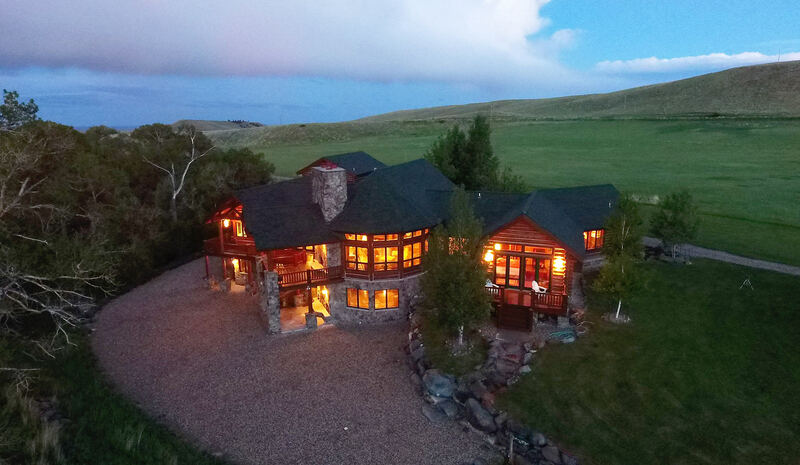 As one of the finest homes and acreages in the Buffalo, Wyoming area, Crazy Woman Canyon Estate provides executive-style living in a distinctive setting. Nestled along the North Fork of Crazy Woman Creek and below the jagged rock outcroppings of the Bighorn Mountains, the views are nothing short of breathtaking. 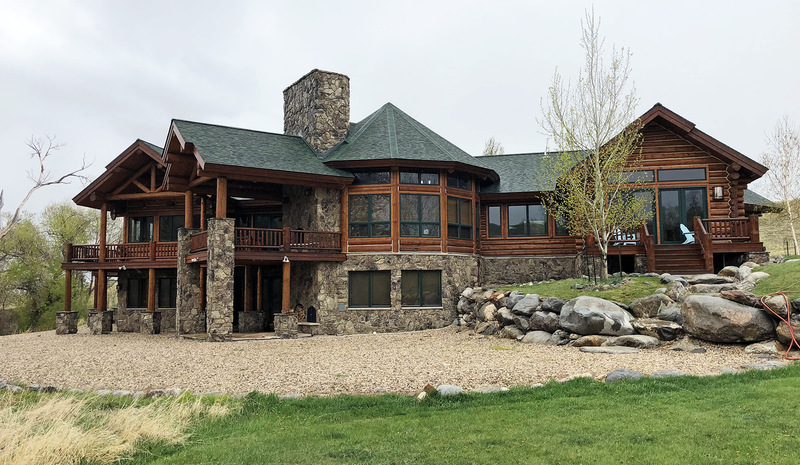 The well-designed and luxurious log home consists of 6,685± square feet of indoor living space and over 1,500 square feet of decks overlooking the creek. 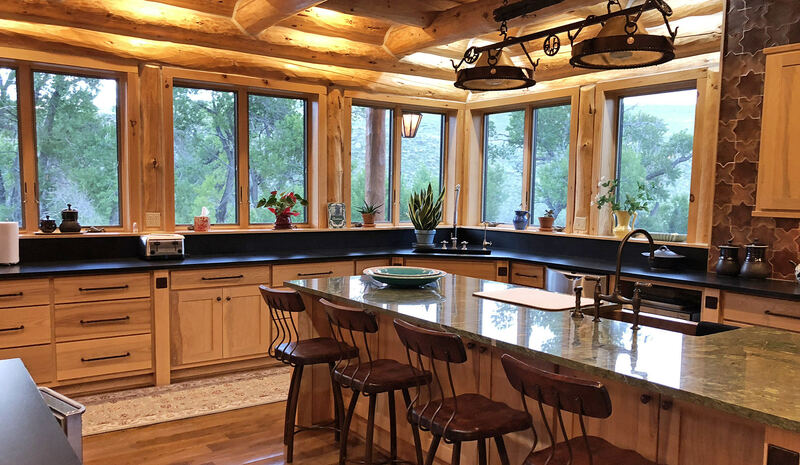 The Estate, comprised of 165± deeded acres, is situated in the eastern foothills of the Big Horn Mountains and a short drive from the quaint western town of Buffalo. The lush river bottom lined with cottonwood trees attracts wildlife including elk, whitetail deer, mule deer, antelope, sharp-tailed grouse, Hungarian partridge and turkey. 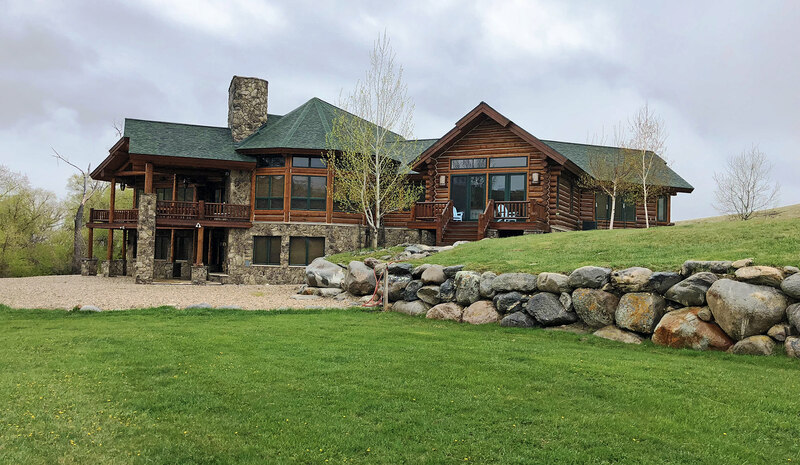 Located just 15 miles South of Buffalo, Wyoming, via Old Highway 87, and Crazy Woman Canyon Road, the Ranch enjoys excellent year around access and privacy. Johnson County Airport (KBYG), a well-improved airstrip capable of handling good-sized aircraft, is located in Buffalo, Wyoming. The lighted asphalt runway is 6143' x 75' with a beacon operating from sunset to sunrise. Buffalo also has all the essential services needed before heading to the Ranch. With a modern hospital and clinic, two grocery stores, sporting goods store, four banks, several agricultural supply, hardware and lumber stores, a movie theatre, fine dining and an excellent public-school system, Buffalo is able to provide all of the essentials. Sheridan, Wyoming, 30 miles north of Buffalo via Interstate 25 along the Big Horn Mountains, provides additional services including exceptional restaurants, large building-supply stores, Walmart, commercial flights connecting to Denver and a fine downtown shopping experience. Sheridan provides a great mix of the old west and modern conveniences. Casper, with a population of approximately 55,000 people, is the second largest city in Wyoming and is located approximately 100 miles south of the Ranch. Casper serves as a major hub to central Wyoming and provides all of the essential products and services and is also home to the Natrona County International Airport, with regular flights to Denver and Salt Lake City. 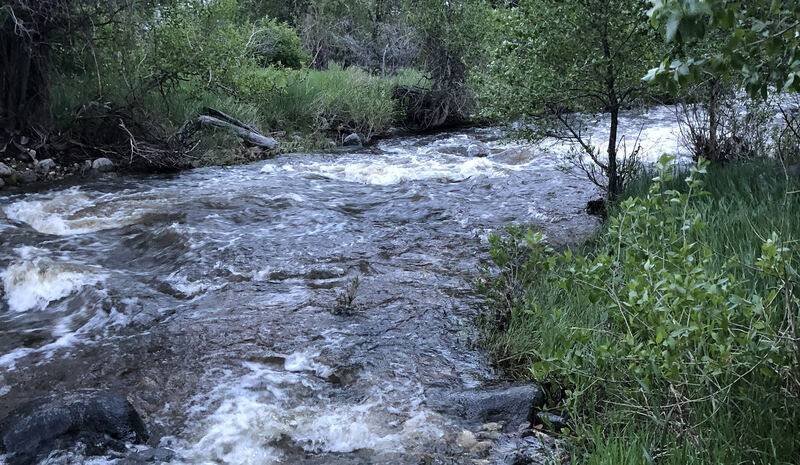 Situated on the North Fork of Crazy Woman Creek, the physical characteristics of the Ranch include a lush creek bottom, flood-irrigated meadows adjacent to the home and native pastures rising away from the creek. 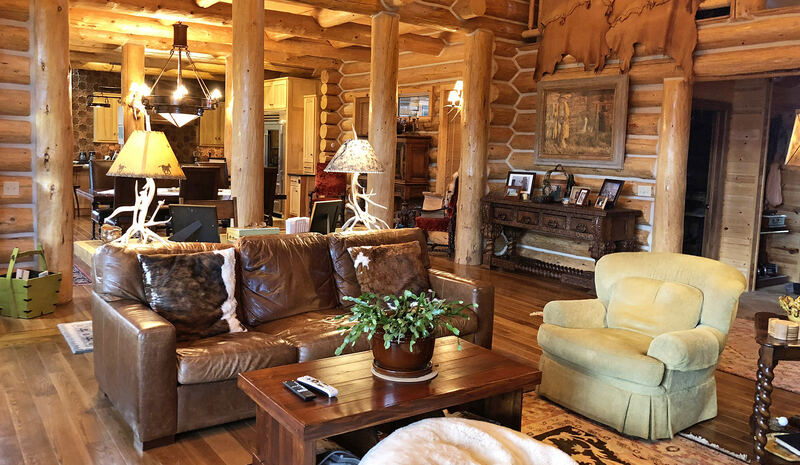 Central to the Ranch is the log home, which is the centerpiece of the property. Tucked into the edge of the trees and along the banks of the creek, the sounds of the creek can be heard in nearly every room of the house. The Ranch elevation is approximately 5,375 feet above sea level. Buffalo experiences a semi-arid climate with cold, dry winters, wet springs and hot summers. The average annual precipitation in nearby Buffalo is 13.26 inches. The Ranch sits in a valley that is noted for exceptionally mild winters. When much of the surrounding area is covered in snow, often the Ranch is enjoying milder conditions. This proves to be beneficial from the standpoint of good year-round access and more accommodating weather for livestock. The North Fork of Crazy Woman traverses the property for approximately .6 miles. The Ranch has direct flow irrigation rights from the North Fork of Crazy Woman Creek. A tabulation of water rights can be provided to qualified buyers upon request. The 2017 real estate taxes were $7,025.77. 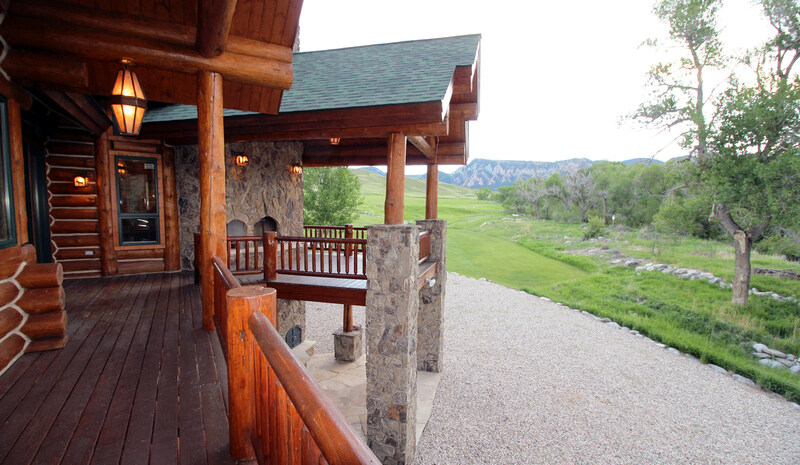 The log home, constructed in 2005, is the centerpiece of the Ranch. Consisting of 6,685± square feet of indoor living space and over 1,500 square feet of decks overlooking the creek, the attention to detail is evident throughout the home. With four bedrooms and four half bathrooms, and an additional living quarters above the garage, the home has enough room for your family and closest friends. With wood and tile floors throughout the main level, tiled showers, custom doors and trim, custom iron light fixtures throughout the house, and uniquely stained and stamped concrete floors in the basement, the quality of craftsmanship is notable. The spacious living room with vaulted log ceiling is well situated to serve as a gathering place for friends and family. A large rock fireplace anchors the room and adds the perfect ambiance to the evening with the sounds of a crackling fire. A raised loft area above the living room includes a freestanding propane stove and provides a cozy spot to read or relax. 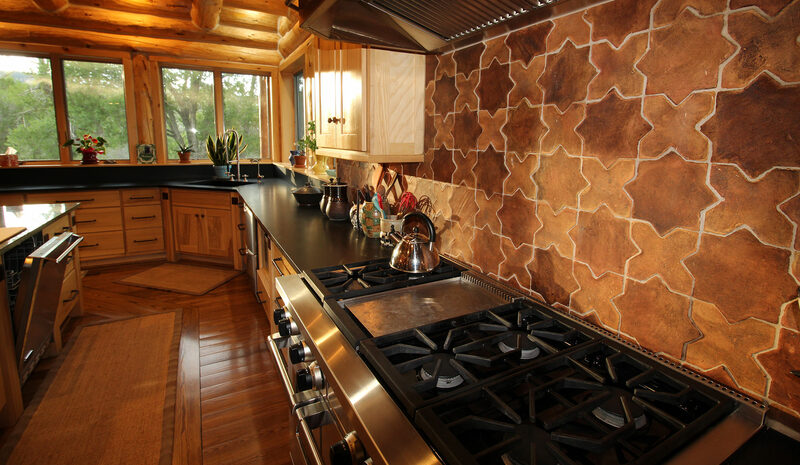 The kitchen overlooks the creek and features granite countertops, a copper farmhouse sink, copper colored backsplash, top of the line appliances, and a functional layout. The master suite has its own deck which has an amazing view of Crazy Woman Mountain. Upon opening the door onto the deck the sounds of the creek are heard. The master bathroom has a luxurious deep soaker tub and a walk-in tiled shower with copper trim. An oversized shower head coming from the ceiling is very inviting. The outdoor living space consists of 1,500 square feet of decks and stone patios. 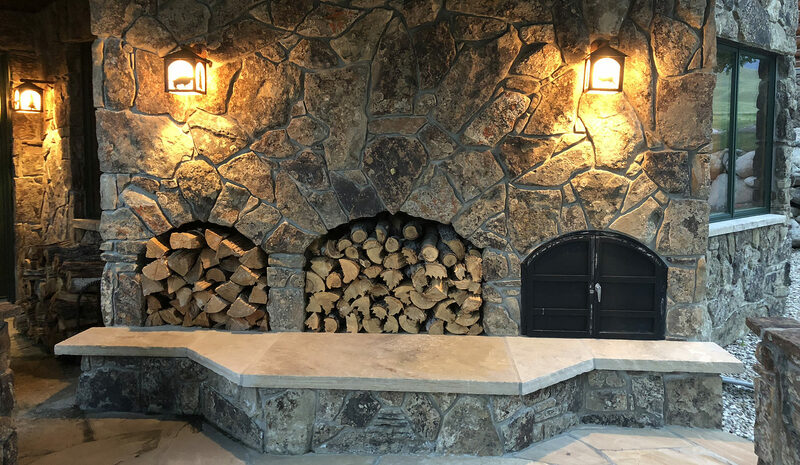 Two outdoor fireplaces provide opportunity to take the chill off as the sun sets behind the mountains. Downstairs, a family room with a long shuffle board table is the first attraction to be found. Two additional bedrooms are in the basement including one master guest suite and a bedroom with 3 bunks beds and nearby bathroom. Living quarters above the three-car garage includes a kitchen and living area, a large bedroom and a bathroom. Electricity is provided by Powder River Energy Corporation. Cellular communication is available on the much of the Ranch via Verizon Wireless. Satellite internet is provided by Hughes, domestic water is provided by a well and the sewage system is septic. Many of the house furnishings are for sale separately from the real estate. A list of personal property for sale separately can be provided to qualified buyers. The Seller hereby makes known that there may be variations between the property boundary lines and the location of the existing boundary fences on Crazy Woman Canyon Estate. The Seller makes no warranties with regard to the location of the fence lines in relationship to the property boundary lines, nor does the Seller make any warranties or representations with regard to specific acreage within the fenced property lines. The Seller is selling Crazy Woman Canyon Estate in its “as is-where is” condition which includes the location of the fences as they now exist. Boundaries shown on any accompanying maps are approximate. The maps are not to scale and are for visual aid only. The accuracy of the maps and information portrayed therein is not guaranteed nor warranted. The Buffalo, Wyoming area is rich in history as multiple battles took place in the region. The Johnson County War, a battle between large cattle barons and homesteaders, took place just a few miles from Crazy Woman Canyon Estate. Also just a short drive from Buffalo is the Fort Phil Kearney historic site, the Fetterman’s Massacre Site, Wagon Box Fight and the infamous “Hole in the Wall”- which was the hideout of the notorious Butch Cassidy and the Sundance Kid along with the rest of the Wild Bunch. The Jim Gatchell Museum in Buffalo is a must see with over 15,000 artifacts from the old west. The historic Bozeman Trail marked its path through the area and served as an overland route connecting the gold rush territory of Montana to the Oregon Trail. The Basque culture is very rich in Johnson County. Many families in the area emigrated from the Basque country of the Pyrenees Mountains between Spain and France and made this area their home. Watching over large flocks of sheep they became a cornerstone of the local culture. The area economy is driven by agriculture, tourism and energy development. However, through the boom and bust of energy development, agriculture has remained the backbone of the local economy. Tourism continues to be a viable economic factor as Buffalo is located at the intersection of Interstate 90 and Interstate 25 and is a logical stopping point for visitors heading to Yellowstone National Park. As a result, Buffalo has excellent hotel amenities and restaurants. The Ranch is home to an abundance of wildlife including elk, whitetail deer, mule deer, antelope, sharp-tailed grouse, Hungarian partridge and turkey. The North Fork of Crazy Woman, which traverses the Ranch for .6 mile, provides anglers to opportunity to fish private waters teeming with brown, brook and rainbow trout. With a healthy riparian zone of cottonwoods, willows and abundant grass, many species of wildlife are attracted to this space for food, water and cover. Muddy Guard #1, located near the Ranch, is considered a trophy fishery and regulations limiting the use of live bait has enhanced the quality of fish in the reservoir. The Muddy Guard reservoirs are managed by the Wyoming Game and Fish department and provide excellent fishing opportunities. Crazy Woman Canyon is just west of the Ranch and provides the opportunity to be “in the mountains” in just a matter of minutes. With rock climbing, camping, sightseeing, horseback riding, four wheeling or picnicking, Crazy Woman Canyon is a unique mountain setting consisting of towering rocks and waterfalls. Situated on the North Fork of Crazy Woman Creek and amongst the towering cottonwoods, one can find the Crazy Woman Canyon Estate. 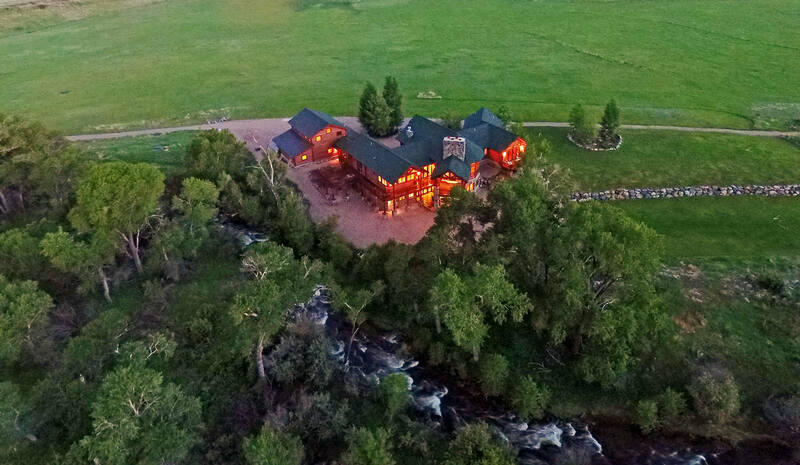 Comprised of 165± deeded acres and a 6,685± square-foot luxurious log home overlooking the creek, nearly everyone who comes to stay will discover a new element of enjoyment and contentment. The property is home to an abundance of wildlife and provides private fishing in live water. 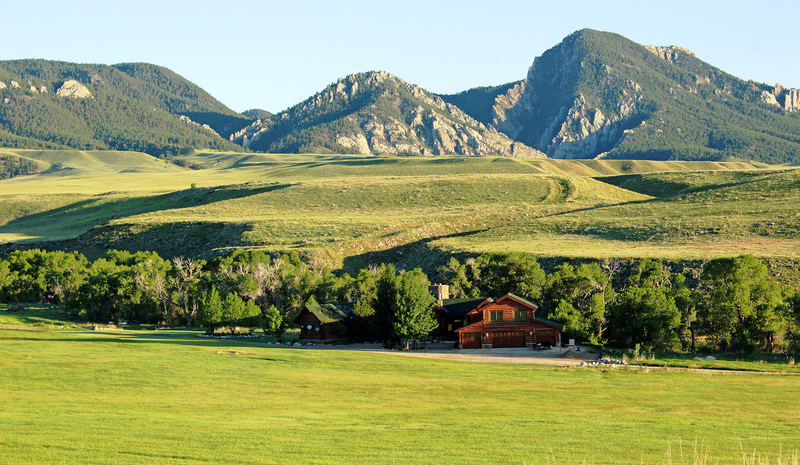 Located at the base of the Bighorn Mountains and approximately 15 miles south of Buffalo, Wyoming, the Ranch enjoys a private setting, yet is only a short drive from the amenities of town. 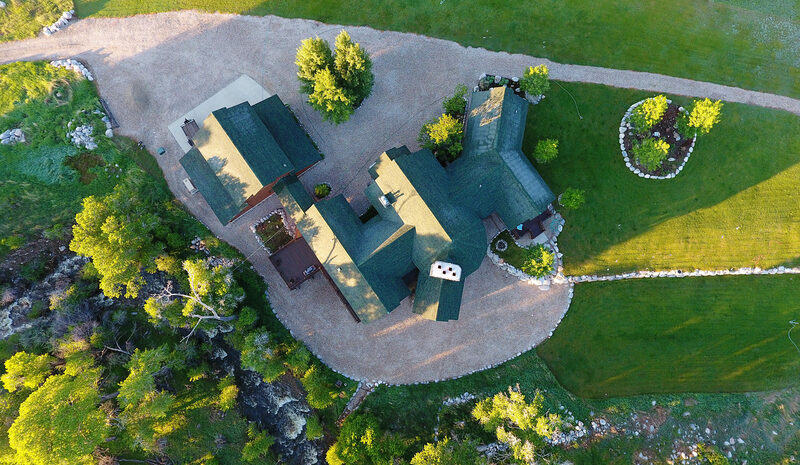 Buyers seeking privacy, luxury, live water, excellent improvements and convenience to town will enjoy discovery of the Crazy Woman Canyon Estate. Earnest money deposits will be placed in escrow with First American Title Insurance Company, Buffalo, Wyoming.